Tenali Ramakrishna Kavi - Ramalinga Attempts to Turn a Dog Into a Cow!!! The first rays of Sun were spreading on the world driving away all the evil and darkness from. Just then King Rayalu woke from deep sleep. Yawning he came out of his palace room and clapped calling, who is there? Running came a soldier, Yes My Lord! bowing his head to the King. Go right away and bring the barber along ordered Rayalu. Taking the instruction, soldier left saluting the King. Rayalu re-entered his room and just rested in the easy chair in there. Immediately he went into sound sleep again. The barber rushed in on hearing the call of King Rayalu. Eventually, he slowly entered the room of the king to find Rayalu sleeping in the armchair. Sensing the King to be too tired the barber never wanted to wake him up. Putting all his experience and expertise, barber completed his job shaving the beard and cutting hair. Finishing his work barber left the place in all silence. After sometime, Rayalu opened his eyes. He did not find the barber waiting by the door. Angrily he clapped for the attendant and shouted at him to bring the barber in a moment. Slowly he got off the armchair and casually put his hand on the chin, Surprise! It was like a freshly done. Rayalu grew suspicious and walked in front of the mirror and looked at his image in there. The hair was cleanly cut and beard was neatly shaved. Rayalu was stunned to know barber’s desire. However, he assured, “This is not any big boon, tomorrow itself your wish will be fulfilled.” He waved the barber to leave, and summoned for some Brahmins. The next morning, the Brahmins who were ordered on to the job took the barber to the Coast of Suvarna Mukhi River and started chanting some hymns standing around him. King Sri Krishna Deva Rayalu was watching the performance sitting at a distance and was supervising what was happening. The barber submissively saluted, “Master! I am happy with your kindness, I do not need anything” and left for home. 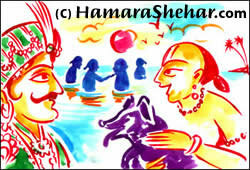 Rayalu as usual, felicitated Ramalinga for opening his eyes and protecting from doing things against the Dharma.